Articles » What is sleep apnea? Expediting VA Claims – Can it be done? Obstructive sleep apnea (OSA) (ICD-9-CM 327.23) is the most common form of sleep apnea and is caused by an airway blockage that occurs when the soft tissue in the back of the throat narrows or closes during sleep. The brain then senses the inability to breathe and briefly arouses the person to begin breathing again. True obstructive sleep apnea occurs when tissues block the upper airway (e.g. large adenoids, deviated septum). Central sleep apnea (ICD –9-CM 327.27) occurs when the brain does not send proper signals to the muscles that control breathing which results in the person awakening with shortness of breath. Complex or mixed sleep apnea is a combination of both obstructive and central sleep apnea. As mentioned earlier, pure obstructive sleep apnea involves abnormalities of the upper airway such as enlarged tonsils, large tongue or blocked nasal passages. Interestingly, in all these cases there is no mechanical blockage to the airway during wakefulness; obstruction occurs only during sleep. Thus, it is clear that in obstructive sleep apnea cases, the brain is also involved. The brain does not send proper signals to the muscles that control breathing during sleep. Thus, all sleep apnea cases are in fact mixed sleep apnea. I have yet to encounter a single case, however, that was not diagnosed as obstructive sleep apnea. Obstructive sleep apnea has become the term of art for all sleep apnea. For rating purposes, the rating table does not distinguish between obstructive, central and mixed sleep apnea. OSA patients were shown to maintain their upper airway patency in wakefulness via a compensatory, augmented EMG activity of their airway dilator muscles, during wakefulness [and non-rapid eye movement (NREM) sleep]. Remarkably, sleep apnea patients experience little or no problems with their breathing or airway patency while awake. In fact, the great majority of people with sleep apnea possess ventilatory control systems that are capable of precise regulation of their alveolar ventilation and arterial blood gases with extremely small variations from the norm. Electrical activity from medullary inspiratory neurons, and EMG activity of diaphragm and abductor muscles of the upper airway in healthy humans show reductions in amplitude upon the transition from awake to NREM sleep, usually accompanied by a mild to moderate hypoventilation and two- to fivefold increases in upper airway resistance. A fast and highly variable breathing frequency is a hallmark of rapid eye movement (REM) sleep in mammals. An excitatory drive to breathe is common in REM, with increased diaphragmatic EMG activity and increased activity in many medullary respiratory neurons above those levels observed in NREM sleep or quiet wakefulness. In REM sleep, there are both tonic excitatory inputs and phasic inhibitory inputs in the brain respiratory centers that account for irregularities in breathing pattern, as well as the loss of excitation, which contributes to hypotonia of the muscles of the upper airway. This results in collapse of the airway leading to sleep apnea. “Fluoro-deoxyglucose PET imaging shows that fear-conditioning and extinction are located in the amygdala and dorsal anterior cingulate cortex (dACC) and other areas associated with memory for the extinction (inhibition) of this fear (an “extinction memory network”) that includes the hippocampus and ventromedial prefrontal cortex (vmPFC). The “anterior paralimbic REM activation area” overlaps with fear and extinction circuits. Fluoro-deoxyglucose PET image of areas that reactivate during REM sleep following relative quiescence during NREM sleep…Walker and colleagues suggest that REM sleep serves the dual purpose of consolidating the content of emotional memory and diminishing the memory’s emotional charge. Similarly, regulation of mood and working through of emotional responses to intra- and interpersonal stressors have been linked with REM sleep and associated dreaming. Significantly, a broad anterior midline area of cortex and subcortex (the “anterior paramedian REM sleep activation area” selectively activates during REM sleep following relative deactivation during non-REM (NREM) sleep, and this region encompasses both the fear expression and extinction memory networks. There are two basic mechanisms for obstructive sleep apnea. The first is static narrowing of the airways due to swelling of structures that block the airway. Some examples are septal deviation of the nose, or accumulation of fat in the retro pharynx noted in certain types of obesity. The second, and more frequent reason for sleep apnea, are dynamic processes that involve the muscle tone, mostly of the tongue due to hypotonia of the genioglossus muscle. “Obstructive sleep apnea (OSA) is a common disorder, characterized by repetitive upper airway collapse during sleep. Upper airway collapse in OSA is thought to occur at sleep onset because of the reduction of activity of several upper airway dilator muscles, which then do not hold the anatomically vulnerable airway open. 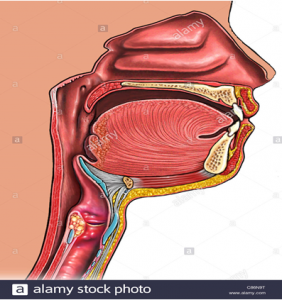 The picture above demonstrates how the tongue plays a major role in airway obstruction, especially if one breathes through the mouth rather than the nose. When the tongue muscle (the genioglossus) tone is deactivated ore relaxed, the tongue will slip backwards and obstruct the airway. Jordan et al. have shown that when patients with OSA spontaneously overcome their tendency for airway collapse and have stable breathing during sleep, the genioglossus muscle is more active than during disordered breathing events. Many patients with obstructive sleep apnea (OSA) have spontaneous periods of stable flow limited breathing during sleep without respiratory events or arousals. In addition, OSA is often more severe during REM than NREM and more severe during stage 2 than slow wave sleep (SWS). The physiological mechanisms for these observations are unknown. Thus we aimed to determine whether the activity of two upper airway dilator muscles (genioglossus and tensor palatini) or end-expiratory lung volume (EELV) differ between (1) spontaneously occurring stable and cyclical breathing and (2) different sleep stages in OSA. The activity of the genioglossus has previously been reported to be higher during SWS than stage II sleep. The high arousal threshold that occurs during deeper stage II can allow large genioglossus muscle activity to develop, stabilizing the airway such that sleep can continue and SWS can develop. Respiratory events are often worse during REM than NREM sleep. Jorden et al. found that the tonic (expiratory) activity of the genioglossus was reduced during respiratory events in REM compared to stage II sleep. This reduction in tonic genioglossus activity may contribute to the predisposition to airway collapse that occurs in REM because airway collapse typically occurs at the end of expiration. During REM sleep, further suppression of the tonic component of the genioglossus activity was observed, potentially contributing to the increased severity of OSA in REM sleep. About 26% to 31% of veterans in the U.S. are estimated to be affected by posttraumatic stress disorder (PTSD) in their lifetime. Individuals with PTSD often report sleep disturbances including trouble in falling and maintaining sleep, recurrent nightmares about trauma, and other disruptive nocturnal behaviors such as anxiety and night terrors during sleep. [vii] [Exhibit 4] Veterans with PTSD have a higher prevalence of obstructive sleep apnea (OSA) than the general population. Untreated OSA accentuates the sleep-related symptoms of PTSD, especially the number and intensity of nightmares, repeated awakenings, difficulty falling back to sleep, and increase in daytime sleepiness and tiredness. A growing body of evidence suggests that disturbed sleep is more likely to be a core feature of PTSD rather than just a secondary symptom. Hypoxia, sympathetic discharge from respiratory disturbances, dysfunctional REM sleep, and abnormal REM mechanism have been proposed as a mechanism for sleep apnea in PTSD patients. Kobayashi et al. conducted a meta-analytic review of 20 polysomnographic studies comparing sleep in people with and without PTSD. Results[viii] showed that PTSD patients had more stage 1 sleep, less slow wave sleep, and greater rapid-eye-movement density compared to people without PTSD. A recent study showed that treatment of OSA with CPAP is associated with a decrease in the number of nightmares and daytime sleepiness in PTSD patients. This study also showed a positive correlation of REM sleep percentage with the number of nightmares. This supports the conclusion that dysfunctional REM sleep mechanism may be involved in the pathogenesis of PTSD. Just as in obesity (see below) there is a bidirectional relationship between sleep apnea and PTSD. PTSD, especially during nightmares, causes sleep apnea. Treatment of sleep apnea ameliorates the severity of PTSD. As REM is central to both conditions, sleep apnea and PTSD, the relationship is quite clear. A recent study reported that REM, AHI and interrupted sleep at night were independent predictors of nightmares in OSA patients, and CPAP therapy results in significant improvement in nightmare occurrence. Apparently when a patient spends more time in REM the likelihood of having nightmares becomes higher. REM suppression with prazosin, an α-1 inhibitor, showed improvement in combat-related PTSD nightmares and sleep quality in active-duty soldiers in a recent trial. This may indicate that suppressing the “dysfunctional REM” in PTSD patients may have helped reduce symptoms. As to the impact of obesity on OSA, while obese patients have a higher incidence of sleep apnea (12%) compared to the general population (4%), the incidence of sleep apnea in obese patients is lower than that reported for PTSD and mood disorder. The critical issue to understand is that the mechanism of the development of sleep apnea is the same in both obese patients and in patients suffering from PTSD. In both cases there is an alteration of sleep and the involvement of REM sleep. Thus, both conditions work in synergy to cause sleep apnea. To argue that only obesity causes sleep apnea is then incorrect. Obesity and PTSD in combination are far more likely to cause sleep apnea then either condition alone. Thus, the effect of one of these conditions on OSA cannot be scientifically segregated from the other. Furthermore, there is a bidirectional effect between sleep apnea and both conditions. Treatment of sleep apnea by CPAP ameliorates the symptoms of PTSD, especially nightmares, and CPAP also results in reduction of weight. Thus, the finding that there is a by directional effect between PTSD and obesity with sleep apnea, cannot be interpreted as a lack of causation of either obesity or PTSD of sleep apnea. After reviewing all of the veteran’s medical and military records, it is my expert medical opinion that it is more likely than not (50% or more) that the veteran’s sleep apnea is secondary to his service-connected Posttraumatic Stress Disorder (PTSD). The scientific observation that the derangement of REM sleep prominent in the PTSD patient is the cause for sleep apnea is of particular importance in this case. Sleep apnea requiring treatment by CPAP warrants a 50% rating.